DETROIT, MI - JUNE 20: Secretary of the U.S. Department of Health and Human Services Kathleen Sebelius speaks about the Affordable Care Act at Covenant Community Care health center June 20, 2012 in Detroit, Michigan. 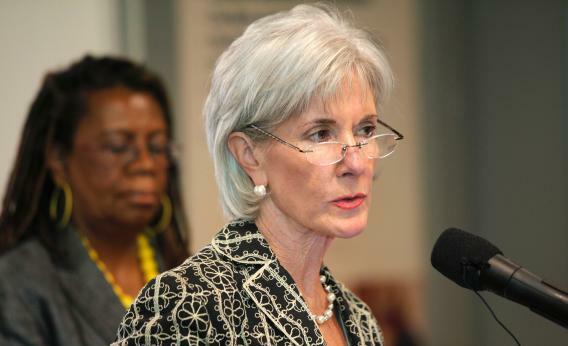 Sebelius announced that $129 million in additional grants from the act will be used to bring primary care to cities around the nation. The U.S. Supreme Court is expected to rule this month on the constitutionality of the Affordable Care Act. The Obama campaign has another new TV spot, this one a positive look at his record on equal pay for women. But Mitt Romney is outraising the president by a healthy margin, in large part because of his ties to the business community and Wall Street. The Obama ground game will be key to countering Romney’s potential financial advantage. The Associated Press has put out its own national poll showing a much tighter race than Bloomberg did yesterday. Obama is back up in Florida, according to Quinnipiac. And the Supreme Court might rule on the constitutionality of the health care law today.